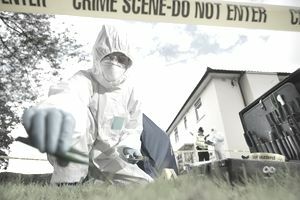 The job of a crime scene investigator isn't exactly like what you see on TV, but it is very much a vital and interesting criminology career. Crime scene investigators respond to crime scenes along with police officers and investigators in order to find and gather evidence to bolster an investigation. They often collect evidence directly from a scene and ensure it is handled properly. Crime scene investigators also work directly with forensic science technicians, providing them with evidence that requires analysis in a laboratory setting. Collaborate with law enforcement officials at crime scenes. Collaborate with forensic science technicians in the laboratory. Identify visual clues at a crime scene. Crime scene investigators also try to piece together what happened from the visual clues available to them. For example, if a victim was shot and killed, the way the body landed on the ground, the angle of the entry and exit wounds, the location of bullet fragments, and more can tell a crime scene investigator a lot about what might have happened. Since crime scenes cannot be preserved indefinitely, investigators need to take photographs and meticulously measure and document where everything was found as quickly as possible so the evidence can be assessed more at a later date. Forensics: This area requires a solid foundation in biology and chemistry. Criminology: This field covers the basics of law enforcement techniques and criminal behavior and patterns. Crime scene analysis: Everything from photography to handling evidence and fingerprints to dealing with violent crime scenes is included here. Criminal law: It's important for anyone working in law enforcement to have a basic understanding of criminal law. Criminal justice ethics: As much as the law is important, it's also necessary for those in law enforcement to have a strong sense of what is ethical. Problem-solving: Gathering visual clues and other evidence at a crime scene and trying to interpret what happened is like trying to piece together a puzzle. Crime scene investigators need to be good at this type of problem-solving. Critical thinking: Before drawing any conclusions, crime scene investigators need to know how to use the scientific method to eliminate all other possibilities. Attention to detail: Examining a crime scene requires the ability to notice minute details and subtle differences. Moreover, the handling and cataloging of evidence must be done following precise procedures so that no evidence can be questioned because of mishandling. Photography: Taking photographs of a crime scene often is part of a crime scene investigator's job. In addition to general photography skills, these professionals need to know how to record all relevant angles and perspectives in the best way possible to allow investigators to study the crime scene after the fact. The U.S. Bureau of Labor Statistics projects job growth for police and detectives at 7 percent for the decade ending in 2026, comparable to the growth projected for all jobs combined. However, crime scene investigators are included in the BLS's numbers for forensic science technicians, and that field is expected to see 17 percent job growth during the same time period due to increases in technology and the reliability of forensic evidence. The work environment varies for crime scene investigators. They must visit crime scenes and collaborate with police officers and detectives to collect and assist with gathering evidence, but they also may assist with forensic science technicians in the lab. Crimes happen at any time, so just like police officers, crime scene investigators should expect to work at any time. They will have fixed schedules and fixed times when they are on call, but those times can be anything from regular business hours to weekends to the middle of the night. College coursework is fundamentally the same as for anyone going into law enforcement. Adding an emphasis on forensic science in college can help steer a student toward crime scene investigation. Working in law enforcement in any capacity is one of the best ways to make connections and advance to a position as a crime scene investigator.